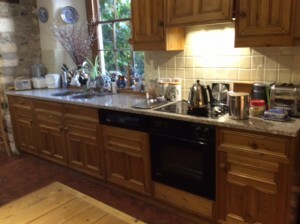 The doors needed easing and new hinges fitting, the handles where refurbish by removing the old coatings, restaining and revarnishing in a light oak finish. 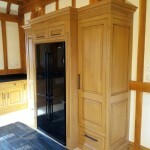 they also required new srews when refitting for a firm fixing. 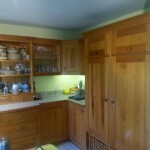 The doors and drawer fronts where then removed and worked on and completed in my workshop, this cuts the time and diesruption down on site to the customer by around half the time. 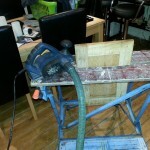 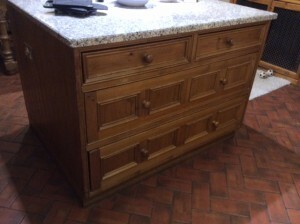 The complete kitchen furniture was then completely steam cleaned to remove all traces of grease, polish and wax. 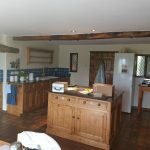 The next job was sand down and prepare and apply the adhesion primer, followed by two undercoats of furniture paint and finished with two top coats of furniture paint in a satin finish in a nice shade of cream that suited the period property perfectly. 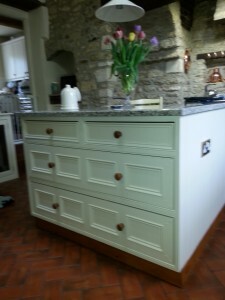 The final job was to rehang the doors and refit the drawer fronts, Another very happy customer in Hertfordshire. 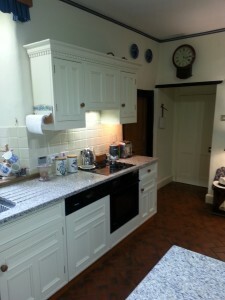 Contact Paul for a quote to refurbish and Hand Paint your kitchen in Northants, Bucks, Beds & Herts.